John Ruskin (1819-1900) was a man of genius and contradiction. He was a polymath with catholic tastes but an obsessive eye for detail, and a gaze simultaneously micro- and macroscopic. A ‘gentleman commoner’ as an Oxford undergraduate, with a substantial private income from his father’s wine business, he nonetheless had a profound sense of the social injustice wrought in part by the industrialization that had made him rich. His career as an art critic and historian ran parallel to one as a political activist and social reformer. Personifying the missionary zeal of ‘eminent Victorians’, he was at once conservative and iconoclastic. The Seven Lamps of Architecture advocates the Gothic revival, but in Modern Painters, Ruskin champions JMW Turner, whose paintings offended popular taste, placing him above the likes of Claude Lorrain, Salvator Rosa and Michelangelo in the canon. Ruskin was a Christian Socialist who defended the exhibition at the Royal Academy of Millais’ Christ in the House of His Parents against accusations of blasphemy. And he was also one of the prose stylists of the 19th century: championed by Proust and Tolstoy. The Seven Lamps, The Stones of Venice, Modern Painters, Unto This Last, and many other writings have been in print continuously since their original publication in the mid 19th century. But he was perhaps as skilful with images as words: Oxford’s Ashmolean Museum holds a large collection of his exquisitely detailed drawings and paintings. 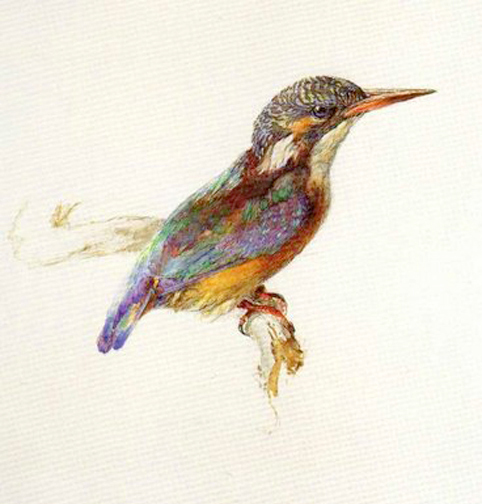 The Ashmolean collection includes Ruskin’s dazzling, life-sized watercolor of alcedo atthis, the Common Kingfisher, which he used as an aid in teaching Oxford undergraduates of Natural Sciences, Greats, Mathematics and all other honours subjects the fundamental techniques of drawing. He founded the Ruskin School of Drawing in 1871 and for eighty years, the school flourished in the basement of the Ashmolean (or the University Galleries, as they were then known): one of Oxford’s best-kept secrets. But both art and teaching have a habit of outgrowing their origins, and Ruskin had a wider agenda. For him, learning to draw accurately but with passion was the key discipline in learning to see. And seeing the world clearly, truthfully, held the supreme position in his moral philosophy. To do so was to revolt against the dehumanizing, instrumentalizing effects of the Industrial Revolution. The heads of the Ruskin that have succeeded him have carried the flame of this insight, and the role has proven flexible enough to include the painter Stephen Farthing, poet and performance artist Brian Catling, sculptor and photographer Richard Wentworth, and the recently appointed head of school, Kant scholar and Fellow of St. Edmund Hall, Dr. Jason Gaiger. Shortly after the Second World war, with the proviso that all students were made to study anatomical drawing (the stipulation continues to this day), the university authorized the school to award its first Certificates in Fine Art (the CFA). In 1981 it awarded its first degree in Fine Art (the BFA, which became a full honours degree in 1992), in 2001 its first MFA and in 2010, its first DPhil. The Guardian University Guide 2012 ranks it the number one art school in the country, with a score of 100%. The kingfisher is a breathtakingly beautiful creature. Much smaller than one might expect, a sighting of it in flight is a rare, heart-stopping delight: a glistening ball of turquoise and saffron flashes in front of the eyes. Their eyesight is peculiarly keen even by the high standards of birds of prey, and they have the rare distinction of using monocular vision in the air but seeing binocularly underwater. So, on the occasion of this 30th anniversary of the first awards of Oxford University degrees in Fine Art, perhaps we might indulge in imagining a few of the Ruskin’s graduates as kingfishers in the wider cultural ecosystem? What would Ruskin, an ardent poet in his youth, make of the metaphor? What would he make of the Pulitzer Prize winning novelist John Updike (a Knox Fellow at the Ruskin from 1953-54) and his fabulously eroticized portraits of baby boomer America? Or of RB Kitaj (CFA, 1960) a painter whose exotic mish-mashes of surrealism, post-impressionism and postmodern angst capture simultaneously the Pop colours of the 1960s, the cultural anxieties of 3,000 years of Jewish history, and the relentless sunshine of 21st century Los Angeles? Kitaj’s best know painting, If Not Not, is a conflation of his own personal history with TS Eliot’s The Wasteland, and some of the most traumatic events of the 20th century. Fifteen years ago, it was scaled up to make the largest tapestry ever woven in the UK. This massive, kaleidoscopic, psychedelically-coloured collage featuring, amongst many other motifs, palm trees, a bespectacled boy being comforted by a naked prostitute, and the Auschwitz gatehouse, now greets visitors to the atrium of the British Library in Euston. The works seems to capture the BL’s motto, ‘For generations of thought.’ And that phrase also seems to sum up the typical Ruskin graduate’s hallmark of being of their time because of looking simultaneously a long way back into the past and a long way forward in to the future. In 2009, Oliver Beer (BFA 2006-9) won the Channel 4/Saatchi Gallery New Sensations prize and used the money to make Motet for a Victorian Sewer, a haunting sound piece that tapped into the unique resonant frequencies of the underground passageways in Brighton. Might Ruskin have been proud of this (thankfully odourless) meeting of a male voice choir with nineteenth century engineering ingenuity? And would the works of Alexandre Singh (BFA 1998- 2001) engage him? Perhaps more magpie than kingfisher, Singh trawls Wikipedia for fabulous facts that he mixes with his own musings to create labyrinthine stories featuring such miscellany as parrots, golems and the lush countryside of Andalucia. He delivers his stories to live audiences in a deadpan fashion inspired by Woody Allen and Lenny Bruce. His recent performance-lecture at White Columns in New York, Alkahest, was a three-hour Singh-athon featuring (amongst many other diversions) a Faustian alchemist seeking forbidden knowledge, an overhead projector and some bawdy stage humour starring a character named Molière. His current solo show at the Palais de Tokyo in Paris, La critique de l’école des objets, is an installation with sound in which the roles of spectator and artwork are inverted. The cheap consumerist objects on display (a toaster, a stuffed skunk, a bottle of bleach, etc.) speculate pompously about the world of human beings. Singh’s work might be performed and displayed in the most rarefied of art world settings, but as this hilarious and thought-provoking piece shows, he has a fine handle on the absurdity of the gallery scene. The whole world, and not just the often solipsistic, hermetic world of contemporary art, is his subject. Singh’s work has tremendous scope and ambition, just like that of other graduates that have gone on to create careers of integrity and originality outside of the fine arts. Large numbers have started their own businesses or forged jobs in the city, medicine and the law. Others have become noted art critics, historians, dealers and museum directors, such as Modern Art Oxford’s current director, Michael Stanley (BFA 1993-6). Or they now work in Hollywood: Paul Franklin (BFA 1986-9) recently picked up an Oscar for his work digitally enhancing Leonardo DiCaprio’s bottom as VFX Supervisor on Christopher Nolan’s Inception. Tom Uglow (BFA 1994-7), a creative director for Google and YouTube in Europe and the Middle East, is spearheading some crucial developments in social media that are enabling the entire online world to interact more imaginatively with one another. Ruskin might have hated the enslaving aspects of industrialization, but surely would have been as quick as the children of the Arab Spring to acknowledge and utilize the revolutionary creative potential of the Internet. All of this is of course fanciful speculation. And why should we care anyway what Ruskin would have thought? What relevance has he to today’s world? On a superficial level, we might connect him with the celebrity artist culture of the moment. His championing of those ‘Desperate Romantics’, the Pre Raphaelite Brotherhood, felt very ‘now’ in the BBC’s recent ribald mini-series. But Ruskin knew that art is infinitely more important than artists, and this is one of the many aspects of his legacy that make him of contemporary relevance. Whilst espousing art’s centrality to life, he never lost sight of the wider picture: ‘Life without industry is guilt, and industry without art is brutality’, he wrote in his Lecture on Art III in 1870. Ruskin might have been shocked by, depressed by or indifferent towards the works of the graduates of his school, and in particular those of the last 30 years that this exhibition celebrates. But he was a man whose vision brilliantly synthesized the very old and very new, recognizing how the apparent ugliness of the contemporary can in time become the beautiful and the classical. ‘Kingfishers catch fire’, wrote one of Ruskin’s protégés, the poet Gerard Manley Hopkins in the same year Ruskin made his watercolour. And Ruskin’s kingfishers have blazed in all manner of different ways after their rigorous three years’ training. In 2011, the first year undergraduates’ visits to the anatomy schools and their compulsory classes in life-drawing keep alive Ruskin’s insistence on seeing that is the basis of drawing, painting, sculpting, writing, film-making, performing: in short, of creation itself. 1997 graduate John Gerrard’s commission for the 2011 Manchester International Festival, Infinite Freedom Exercise (near Abadan, Iran), shows an endlessly evolving, hyper-realistic virtual world. On a 30ft high sculptural LED wall, a single figure in army fatigues moves continuously through a series of military training manoueuvres. Using cutting-edge 3D motion scanning, Gerrard’s piece is a disturbing, lyrical meditation on portraiture. It presents a troubled, contemporary world we recognize, but makes us see and think of it afresh. As Ruskin put it in Modern Painters, ‘To see clearly is poetry, prophecy, and religion – all in one’. And perhaps there’s no contradiction in that.